Hacienda Leon Real Estate Group reps greet attendees at the Business Expo Thursday Sept.13, 2017 at McAllen Convention Center. 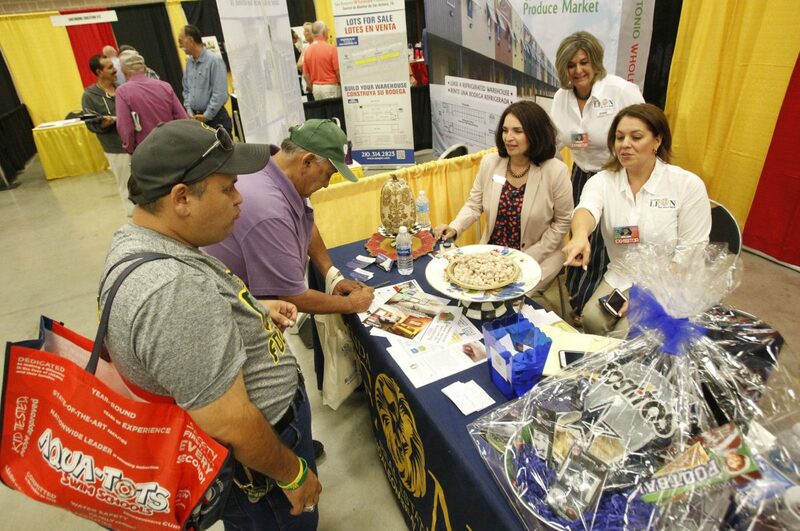 McALLEN — Exhibitors from across the region handed out pamphlets and business cards to anyone who walked by their booths Thursday in the large exhibit hall at the convention center. The 19th annual McAllen Business Expo, put on by the McAllen Chamber of Commerce, brought retail, medical, service and marketing professionals together from all over the area. About 150 exhibitors sprawled across the open hall as an estimated 3,000 attendees mingled throughout. McAllen Chamber President Steve Ahlenius started this event with the hope of connecting businesses with potential opportunities. As the event has grown, Ahlenius hopes to eventually gather over 200 exhibitors. 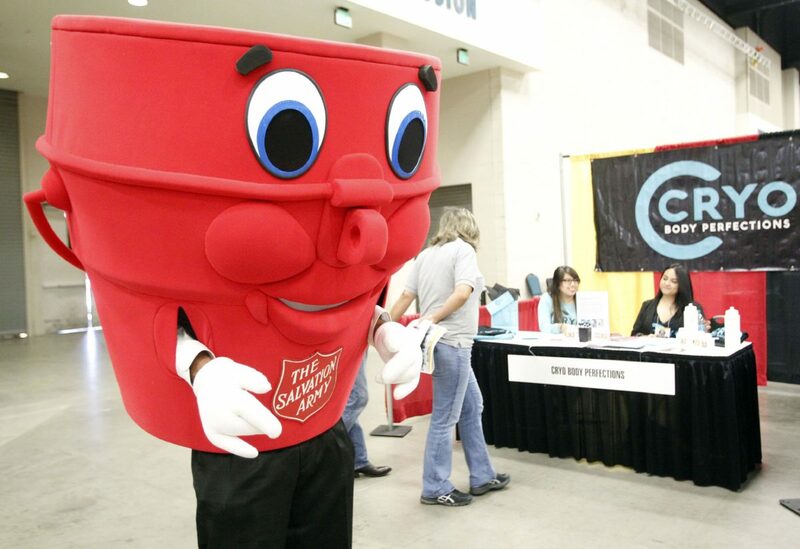 The Salvation Army red bucket mascot walks around the Business Expo Thursday Sept.13, 2017 at the McAllen Convention Center. 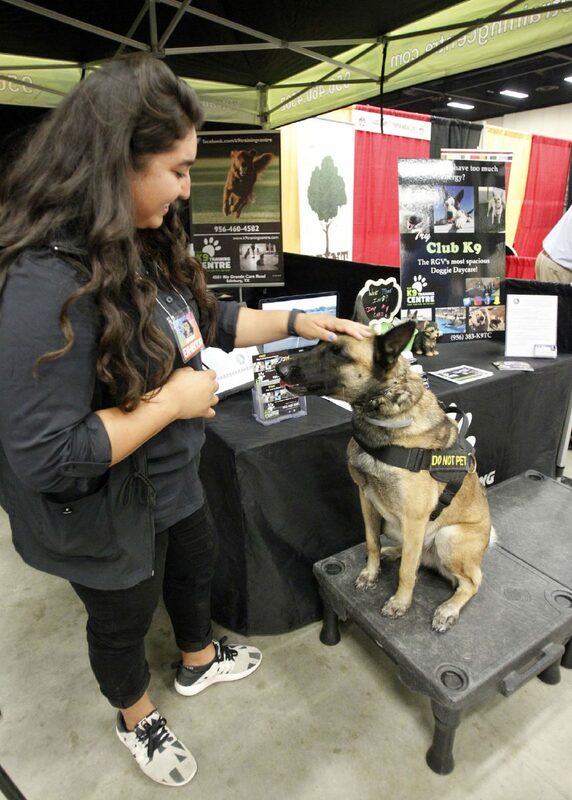 MBrittany Vielma and K-9 Bree at the K-9 Training booth during the Business Expo Thursday Sept.13, 2017 at McAllen Convention Center. 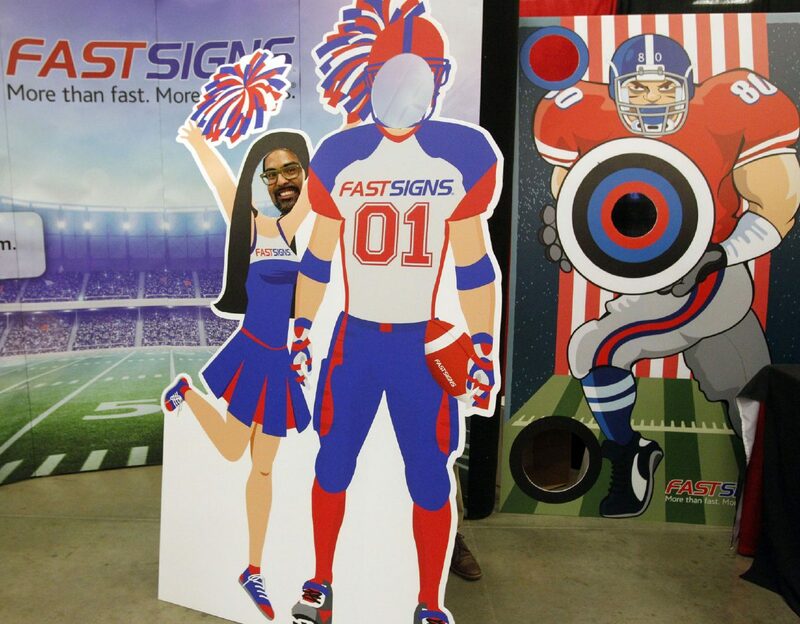 People pose at the Fast Signs booth during the Business Expo on Thursday Sept.13, 2017 at the McAllen Convention Center. Exhibitors at Thursday’s event featured those from the retail world, such as the Rio Grande Valley Premium Outlets; the medical field, such as Advanced Dentistry; retail, such as Latina Hope; produce, such as San Antonio Wholesale Produce market; education, such as multiple University of Texas Rio Grande Valley booths; telecommunications companies, financial groups and many others. A keynote speaker, Jan Hargrave, spoke for two hours in the early afternoon about her profession of reading body language. Local attorneys, business owners, university workers and many more were on hand for Hargrave’s talk.